Cancer is one of the world’s most pressing challenge to research community and leading cause of death. As per the 13th report of American Science of Clinical Oncology, 14 million people are diagnosed with cancer every year. With the advancement of technology and relentless efforts of researchers, quality of life has improved with more cancer survivors and rate of deaths decreasing. From Nov 2016 to Oct 2017, USFDA has approved 31 new therapies for treatment of more than 16 types of cancer. This addresses the need and intensity of problem for future directions in cancer research. Still many more questions are unanswered about the in cancer drug targets and molecular mechanisms of cancer. Fig. 1. 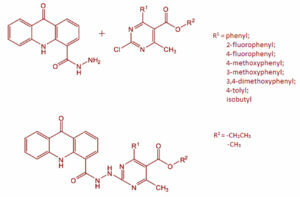 Design strategy of acridone-pyrimidine hybrid molecules. With the application of polypharmacology, hybrid molecules can be modified or developed as privileged scaffolds to achieve full biological potential. Acridones are unique heterocyclic systems with planar structure, ability to exist in both protonated and unprotonated forms, potential DNA intercalators, substrates and inhibitors of many proteins responsible for multidrug resistance in cancer. Pyrimidine, an essential building block of DNA and RNA, heterocyclic ring having great potential to interact with diverse target proteins. Hydrazones are a class of chemicals with both electrophilic and nucleophilic character and has acquired a lot of considerable interest in the design of novel compounds of selectivity, less toxicity and also few of them are currently in clinical use due to its potential to produce various biological activity. Hybrid molecules of acridone with substituted pyrimidines with an hydrazone linker are designed for more selectivity, less toxicity and ability to interact with multiple targets of cancer. Fifteen hybrid molecules of two series were synthesized, purified and characterized by Mass, 1HNMR and 13CNMR spectra. All the compounds were screened for preliminary in vitro cytotoxicity evaluation against A549, MCF7, MDA-MB-231 and Hela cell lines. Results identified that compounds with ethyl ester derivative of substituted pyrimdines have shown appreciable cytotoxicity against A549, MCF7 and MDA-MB-231 cell lines. Especially compounds with 2-fluoro, 4-methoxy, 4-methyl and isobutyl have exhibited better cytotoxicity profile. To evaluate the strength of binding and interpret the SAR, absorption titrations of compounds with CT-DNA was performed. Compounds have exerted DNA binding in the range of Kb 0.251 x 105 M-1 to 2.334 x 105 M-1. Study identified compounds with good DNA binding constant values in both the series. Active compounds were taken up for further in vitro cytotoxicity screening against a panel of nine cancer sensitive and resistant cell lines of breast, ovarian and lung cancer. Compounds were found more selective to cell lines of lung cancer type. To further explore the potential of hybrid molecules, active compounds were screened for western blotting analysis of Akt and ABCC1. Study identified that compounds have the potential to inhibit Akt1 kinase which is very commonly overexpressed in breast, lung, ovarian and gastric cancers, etc. Results with ABCC1 was not found very interesting. Active compounds have remarkably reduced the expression of pAkt in blotting and dragged us for selective Akt1 kinase assay. Akt1 kinase assay identified the compounds with inhibition at nanomolar range with good correlation of in vitro cytotoxicity values. Molecular docking studies of hybrid molecules were performed with DNA and Akt1 (Protein kinase B). To identify the drug likeness features of molecules, we predicted ADME properties and rodent oral toxicity values. All the predicted values of ADMET properties were within the range and no violations were observed. Acute oral toxicity study was conducted for one compound as per OECD guidelines and no sign of clinical toxicity was observed for 14 days after oral administration of upto 5000 mg/kg. Also good correlation was observed with molecular docking results and biological data of hybrid molecules. Findings of the study were hybrids of acridone with ethyl ester of substituted pyrimidines containing 2-fluoro and 4-methoxy have favored the activity, alkyl substituted pyrimidines have exhibited interesting biological profile which need to be explored for design of potential anticancer hybrid molecules. Acridone-pyrimidine hybrids- design, synthesis, cytotoxicity studies in resistant and sensitive cancer cells and molecular docking studies.